I first met Jason through our blogs, but we really connected during an online lecture by Ravi Zacharias. We’ve become fast friends – Christian brother and sister – even though we are miles apart in age, occupation and, on rare occasion, in philosophy. With knowledge of Jason’s journey, his deep love for God and heart for Christ, I was privileged and interested to read and help edit an advanced draft of Jason’s book. His sojourn is amazing; one I think you’ll embrace and applaud. Jason B. Ladd is a Major on Active Duty in the United States Marine Corps. He received a B.A. in Peace, War, and Defense from the University of North Carolina at Chapel Hill (2001). 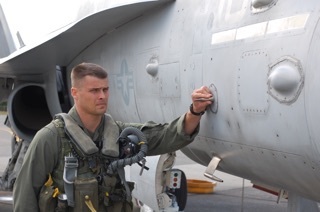 He has over 13 years of service and is a qualified F/A-18 “Hornet” Weapons and Tactics Instructor and a former F-16 “Viper” Instructor Pilot. Jason is an Iraq War veteran who grew up without faith in God. His search for truth and acceptance of Christianity occurred in spite of a secular past. He is a husband and father of six who realizes the importance of raising children to understand spiritual truths about the world. He is outraged at lukewarm Christianity, and has a passion to uplift and strengthen Christian fathers. His book, One of the Few, is about this passion, and is being funded through pre-orders for a November 2015 release. Thank you in advance for your willingness to open your hearts to Jason and his story. I pray for your desire to know how Christ transformed his life, and how he has become a light on a hill through his book. Jason, please give our readers a little insight into the question that brought you from a secular agnostic to an apologist Christian husband and father. That was it. You really believe that? I didn’t know, because I had never given it any thought. Suddenly, although already a dad, I felt woefully unprepared to be a father. What were your goals and intentions in writing this book, and how well do you think you achieved them? The book started off as a “writing project.” I wanted my children to know my story, to see the transforming power of Christ in the heart of those willing to split their lives open against the blade of his truth. Shortly thereafter, I began to see potential for others to benefit from my story. Seekers. Agnostics. Atheists. Men uncomfortable with the concept of faith, and women unsure how to connect with their spiritually-distant men. That’s when I started writing for more than just my children. What makes this book different than other books on the Christian worldview? I wanted to create something to draw the reader into my experience. God has given me an amazing point of view from which to tell my story: through the eyes of a Marine; the canopy of a fighter jet; and from a home filled with a loving wife and children. The book highlights the importance of knowing why you believe what you believe, but has a different flavor than other books written by pastors and theologians. I’ve taken my experiences from around the world, from the California Desert, to Japan, to Iraq, and woven them around my journey to discover what’s truly important. You come from a military background – you’re a guy’s guy, a fighter pilot, a married dad of six. You approach the topic of Christianity through a very personal lens. How will someone who is not a male, not a military man and not a dad resonate with your story of transformation? I think there are women out there with men who either don’t share their faith, or don’t share the depth of their conviction. I used to be that guy. This book gives them a glimpse into the often unstated thoughts of the secular man. This is where the book resonates. The military themes are not meant to resonate, but to reveal, and I think that will be part of its appeal. Few know what it is like go through Officer Candidate Training to become a Marine. Few know what it’s like to fly a Close Air Support mission over Iraq. The book will resonate with younger audiences and pre-parental readers because I’ve written about the things I wish I had known before I was a father. The age in which we gorge on information has us starving for what can be believed as true, and this book helps readers develop a worldview with a solid foundation — a worldview capable of providing hope and help when others are in need. Who is an author you’ve read who has made you think differently about Christianity? The first book I read about Christianity when I began my reconnaissance was Lee Strobel’s The Case for Faith. That was where I first learned that my presuppositions about Christianity were not only unfounded, but well-refuted. Since then, the writings of Ravi Zacharias have pretty much blown my mind. I have read more eloquent writings which speak to both the heart and the mind. They resonate at a personal and experiential level. His level of academic rigor, combined with his demand to care more about the questioner than the question make him one of the most influential Christian apologists of our time. What was the most difficult part of writing this book? What was the part you most enjoyed? Knowing when to use hyphens. We should either get rid of them, or hyphen-ate everything. Seriously. Who has time for that? A difficult part was deciding what to include and what to hold back. It’s a book about my life, but it’s not a celebrity confessional. It’s also written for my children to read, and because of that, some discernment was warranted. There is a danger in presenting a life which seems too clean (which I assure you, is not the case). But I don’t think every person has to hit rock-bottom to have a story worth sharing. The enjoyable parts were with earbuds in, Hanz Zimmer blazing, and watching the pages write themselves. That may have only happened a few times, but it was cool. Having the cover designed was a fun experience as well because I was able to take my original concept and watch it materialize into something greater than I expected. At this writing, you have six children ranging in age from eleven to soon-to-be-born. If you could instill one message in them about God, what would that single message be? He is there. He is great. And he will have us all together on the far side of their darkest days. Any last thoughts you’d like to tell my readers you haven’t been able to communicate through the questions above? Thank you for reading. I don’t deserve an audience. But I’m starting to accept the concept of receiving what I don’t deserve. Thank you. I’m not seeing a WordPress Follow button on his site? Hmmm. He’s on Disqus, not WordPress. As you scroll to the bottom of his site, there’s an envelope icon you can click to subscribe via email. Great, Lori. So glad, and thank you. Jason is actually one of the very first blogs I followed when I began here on WP. I think he has a voice and experiences that will draw in people who might otherwise run from the typical “Christian” Great post! Sounds like I would connect greatly with Jason too. I supposed I need to get over to his blog. 🙂 Great interview! Thanks, Heather. He really is an amazing young man. I pray he receives the needed support of pre-orders to publish this first book. It’s quite unique and deserves uplifting from our brothers and sisters in the faith. Susan, the world needs more heroes like this. I’m praying that my sons will rise up to be as bold and as godly. I agree, Wendy. Thanks so much for Jason. This is an interesting interview. It is sometimes hard for me to imagine reconciling guns and God, but I understand the context in which they are often found together. I will have to familiarize mysself further with Ravi Zacharias. Inspiring. Great idea to interview people, Susan, it brings faith alive. Ravi Zacharias is an inspiring apologist for the faith. I think you would like him, Beth. If you look him up on youtube, you’ll find lots of his lectures. He, too, came to God via a different path. With Jason, (as with any Christian who is serving in the armed forces) it’s not about the guns. Being in the military, he does have a distinctive POV (hence the occasional differences in focus). He definitely has a heart for God, and his training helped him with his discipleship in a way that others might not understand at first, but will appreciate after reading his book. Praise God that he found Jesus. Amazing God had already put a Christian woman in his life. Thank the Lord he is using Jasons journey. Thank you for sharing Susan. God bless You and Jason. Yes, Tom. I’m certain God intended to work through Jason all along. He just needed to catch up. 😉 Kinda like the rest of us. And thank you for reading about Jason. If you go to his site, you’ll learn more about him. I pray we can bless him with our love and support this week. Wonderful interview. Thanks to you, Susan, and to Jason! “Receiving what I don’t deserve.” A great summary of Christian faith. Thank you, Elouise, and bless you for the read. I pray for Jason’s success. He truly does have a heart for Jesus.